We hope this blog finds you with a peaceful mind, body and spirit. No, we are not becoming all-knowing gurus but we do want to bring your mind to the present and introduce you to Addicted's latest showcase artist, NH (Nicole Pon Horvath). French born, NH has been taught by Japanese Masters. 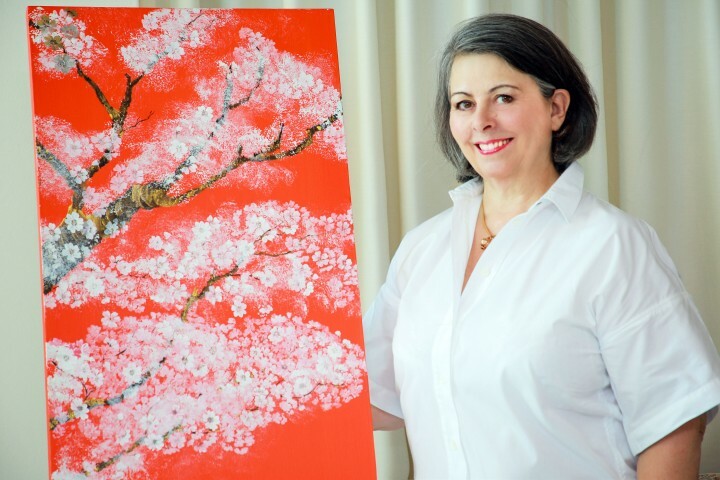 She has studied the traditional disciplines of ‘Sumie’ (ink painting), ‘Nihonga’ (painting with pigments) and ‘Ikebana’ (Sogetsu Master). In addition, NH is a creative art framer, and fashion designer (Doreme). NH’s work expresses the sensitive transformation of emotions which occur during meditative awareness. In this stillness, the search is for peaceful contemplation to open hearts and minds, creating moments of happiness and profound connection to the natural elements. 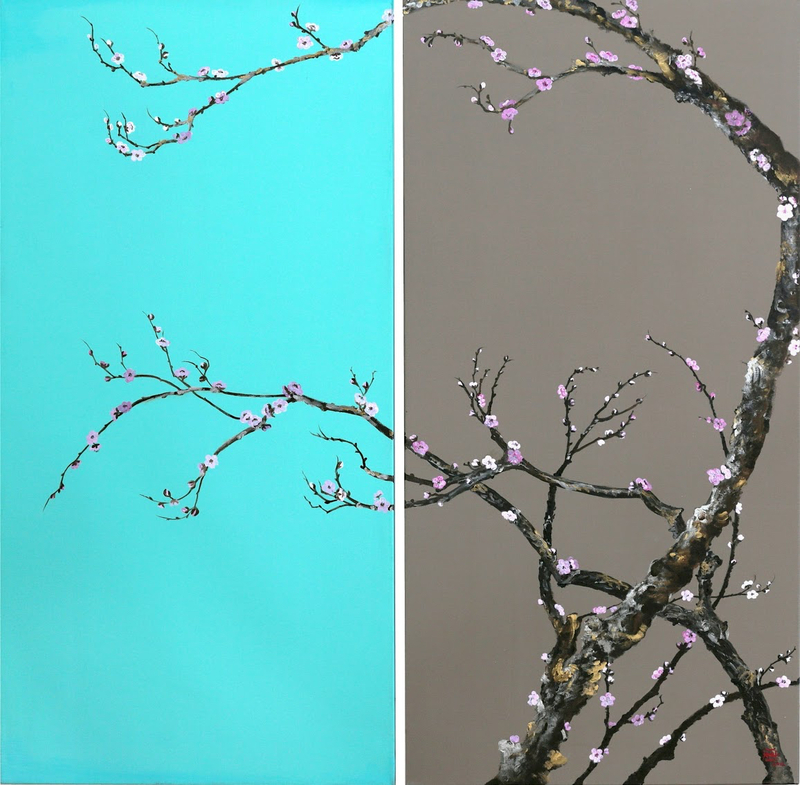 NH’s current inspiration stems from nature, particularly exploring the moon, bamboo and trees – painting on canvas with acrylics. She is fascinated with rebirth after trauma, and the inspiration which ignites at times of new beginnings. We’re not sure about loving cleaning the floor or invisible paintings (winky face), but allow us to show you the beautifully Zen works by NH. We assure you, they are very real and visible – and floor cleaning is not required! Arty-Fact: In “Cherry Blooming – Full Moon” NH captures the beauty which surrounds us in nature. The joy of cherry blossom sightings on a full moon night. NH recalls the feeling of being surrounded by blooms during the Japanese cherry blossom season, describing it as being under a cotton cloud. There is nostalgia for comforting moments and memories, remembering the Hanami – the over 1000 year-old Japanese custom of enjoying the beauty of flowers. People hurrying with picnic baskets to secure a spot under the ‘cotton cloud’ to watch, feel, and open their hearts to mother nature. 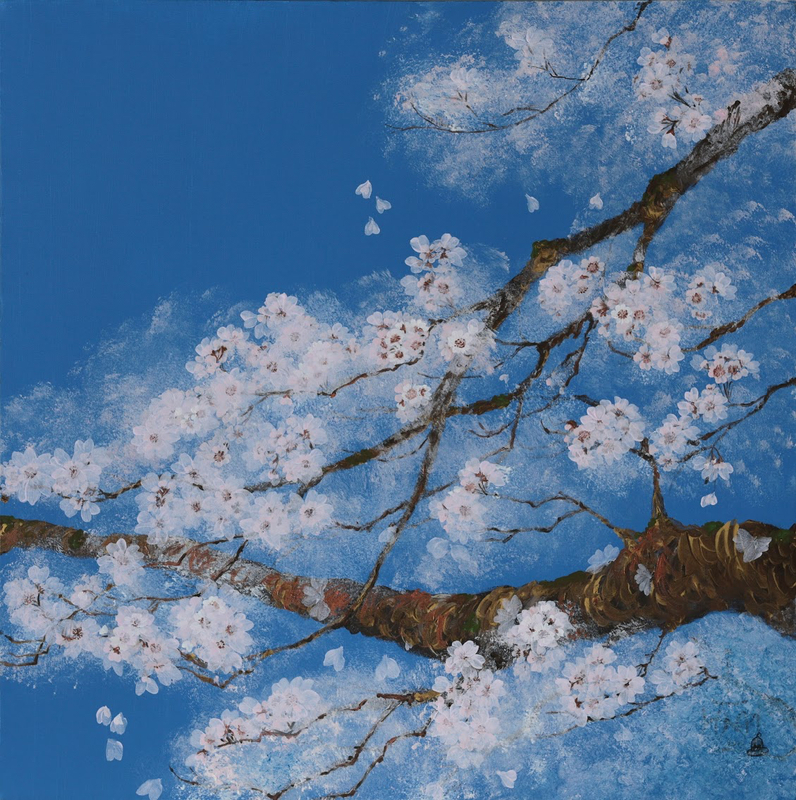 Arty-Fact: The sky is bright and blue and the cherry trees are in bloom on this winter’s day in Japan. The air is fresh and crisp. This is a picture perfect moment for NH. Arty-Fact: NH captures the beauty of an old Japanese plum tree in the early morning hours. It is a scene of rebirth - the first blossoms appearing after the chaos of a bitter winter. The piece is also NH’s first painting after a nine-month hiatus where she dealt with trauma and chaos in her own life. 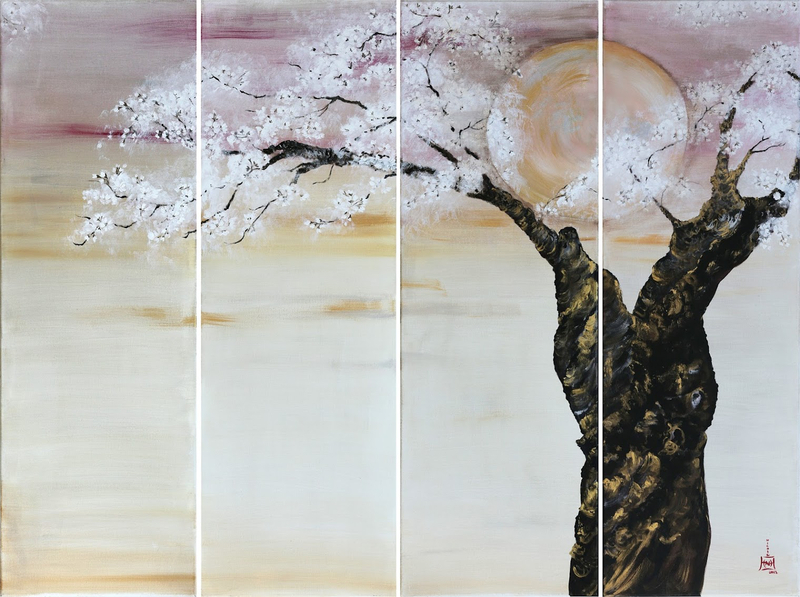 “Old Plum Tree” represents her personal rebirth. 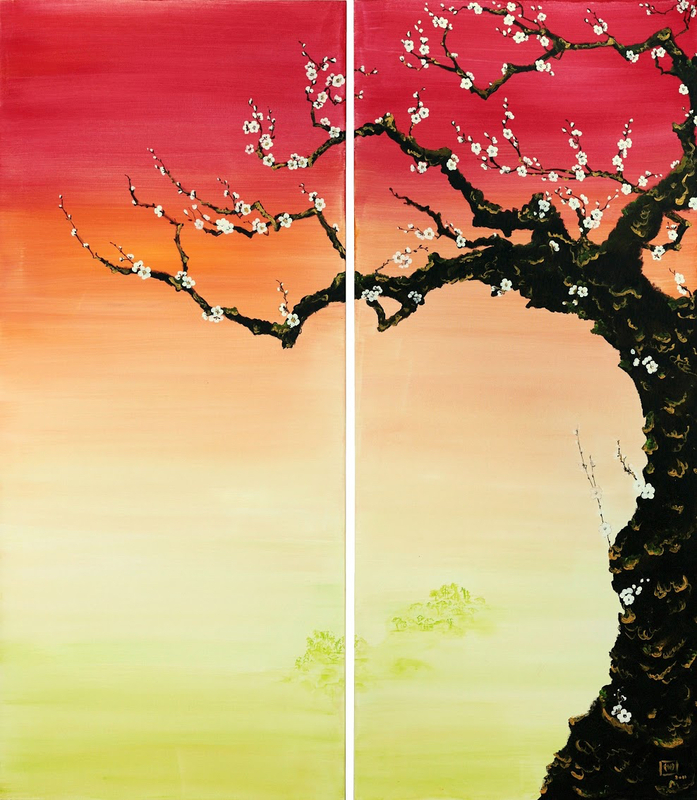 Arty-Fact: NH paints an old cherry blossom tree and wonders about its past. How many years has it blossomed? How many generations have sat under its branches and enjoyed its shade? Memories of the old cherry trees under winter skies in Aoyama surface for NH. The trees continue to bloom regardless of their weathered trunks and hardships – just like the artist. 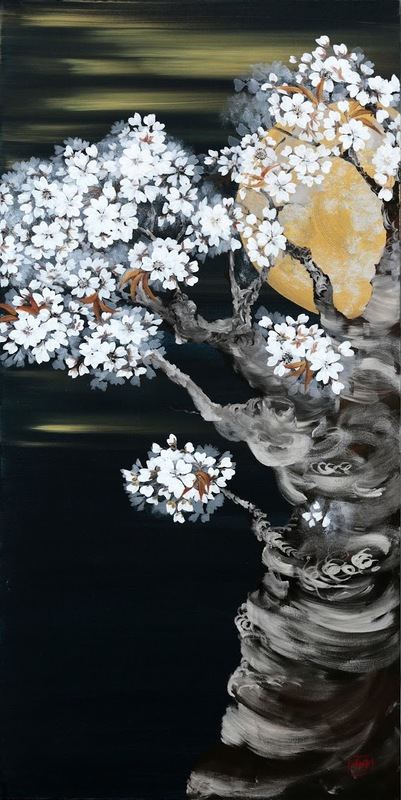 Arty-Fact: “Full Moon and Cherry Blossom” speaks to us about the permanence of nature and its seasonal clock – a time to bloom, a time to wither, a waxing moon, a waning moon - repeating day after day, month after month, year after year. Arty-Fact: The discovery of one’s true self and continued growth is through contemplation and focus. Learning to silence the mind with all the distractions surrounding us allows us to look within and renew our sense of purpose. NH captures the buds of the blossoms at the beginning of their bloom. They represent growth, strength, elegance and a renewed sense of what is possible. Arty-Fact: The pride of nature. Steeped in symbolism, the bamboo represents strength both in nature and in life. It bends but does not break. It stands tall, strongly rooted, yet is flexible. NH draws comparisons between the characteristics of the bamboo and life. NH captures the bamboo simply and beautifully.